description — Measure of the roughness of seafloor terrain, defined as the ratio of surface area to planar area. How is this related to LOS’s and Jeff Ardron’s bottom complexity data? They are similar indices, both based on bathymetric data and both intended to be indices of high biodiversity. Benthic complexity considers how convoluted the bottom is, not how steep or how rough, though these both play a role. The algorithm to compute high rugosity (roughness) comes in a collection of tools known as The Benthic Terrain Modeller (BTM) tool, developed by the Oregon State University (OSU) Department of Geosciences and the National Oceanic and Atmospheric Administration (NOAA) Coastal Services Center. More information on the specific algorithms used can be found in the BTM’s documentation (). 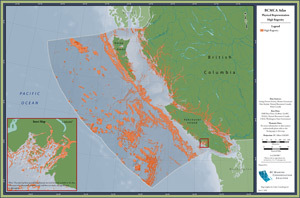 The algorithm to compute benthic complexity was designed by Jeff Ardron and is published by ESRI press, Marine Geography: GIS for the Oceans and Seas (http://esripress.esri.com/display/index.cfm?fuseaction=display&websiteID=61&moduleID=10). Thanks Karin! That’s great information.